'The Scented / Incense Match' is a scented match which acts as a portable, use it where you need it, air freshener. It lights like a match and burns and smells like incense! Quickly eliminate bathroom odors at home, the office, dorm rooms, or while traveling or visiting friends and family. Great for bathrooms, students and dorm rooms, cars, kitchens, sickrooms, or wherever you want to add a fragrance or eliminate an odor. Lighting a match, or preferably two, is a reliable remedy for Level 1 situations. It quickly and effectively masks the bathroom odor with a relatively pleasant and familiar smell. It's important to note, however, that it's not the flame that does the trick, it's the smoke (and the sulfurous smell of the ignition). A bathroom match is simply a match lit after the deed is done, and it is intended to mask the odor. Scented matches are a great alternative to incense. Take them anywhere and strike a scented match for a quick burst of fragrance. Each one has the scent soaked right in! The box contains 50 booklets with assorted fragrances. Some fragrances that are included are: strawberry, frankincense, cinnamon, coconut, sandalwood, french vanilla, rain, patchouly, jasmine, goddess of egypt, musk, and more. What is a Bathroom or an Incense Match? The match.stick that burns like an incense is easy to carry any where 'an air freshener'. Light the head of a incense match stick, let it burns down ¼ inch, tilt downward for 5 seconds, blow it out and lay it on a shallow ashtray and enjoyy. It will burn like a stick of incense. After years of trial and error, UFPL the creators of ‘Bliss Incense Match’, arrived at the perfect mixture of paper fibers, incense and charcoal to create the perfect strike-on-box incense match. Each one of Bliss Incense matches last for about ten minutes bringing delightful fragrances to anywhere you bring the easy to carry incense match box, allowing short aroma therapy sessions for the busy individual. There are over 40 fragrances to choose from. We also accept Incense match stick orders with your own brand name, specification and packaging style on any special occassions. These Matchbooks look and act like your every day match until you blow them out. The matchstick then proceeds to burn and smoke to the base releasing one of many spicy and fruity fragrances. Each matchbook contains 30 matches each. The box of 50 usually contains 2 each of scents: Spice, Patchouli, Musk, Strawberry, Oriental Blossom, Frankincense, Cinnamon, Hollyberry, Rain, Potpourri, Bayberry, Jasmine, Coconut, French Vanilla and Sandalwood and 1 each of rest other frgrances. We also offer them individually. 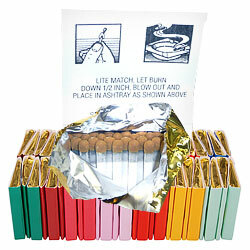 Incense Matches are used in the bathroom, kitchen, or any place needing the air freshened. Light the match, let it burn a little, blow it out, & place in a dish to smolder. More than 40 fragrances to choose from that include Sandalwood, Frankincense, Jasmine, Patchouli, Coconut, Musk, Cinnamon, Rain, French Vanilla, Goddess of Egypt and etc. Custom made assorted box of 50 booklets. We accept orders on your own brand name on the order of 5000 boxes. Like a match. Burns like incense. Easy to carry and an easy air freshener. Follow the directions inside each book. You light the match let it burn down a ¼ inch and blow it out. Now it becomes a stick of incense. Bliss Incense matches last only five minutes but work very hard to make small rooms smell better. Bathrooms, kitchens, motel rooms and even cars seem to come back to life. Five assorted packs of scented matches. * Light, wait a second, blow out, wave in the air then toss in an ashtray or flush. * 50 match books per inner caddy x 50 caddies = 2,500 match books per carton. * Dimensions: 21" x 14.1" x 12.4". Weight: 35 lbs. FOB: New Delhi, India. Reverse Background or any other colors as per customers choice. Sometimes you cannot avoid the need to use the restroom after someone has already--well--made the environment "less tolerable" with certain bodily functions. That's life. A bathroom match is simply a match lit after the deed is done, and it is intended to mask the odor. Any match will work, but the term bathroom match typically means a match infused with an aroma and designed to burn similar to incense. 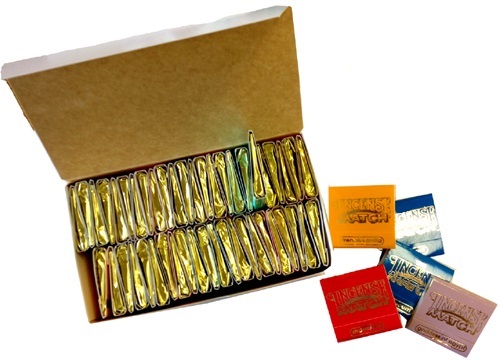 Bliss Incense Match, is a popular brand of incense matches used all over the world to make the trip to the bank, after someone has already made a deposit, a little more easy on the ol' olfactory. The theory is simple: you light the incense match, let it burn for a short period, and then blow it out. You will see the smoke waft off the match and start dispersing into the air, getting to work on that nasty cloud you just created (or that other person so rudely left for you! ), then you can drop it in the toilet, or you can place it in a shallow ashtray, either way has the desired effect. Later on we're going to talk about exactly why does lighting a match remove the odor from the bathroom?